What a great game for the last game in our conference schedule. The Tigers pulled out ahead right before halftime, and continued to outplay and outshine N.C. State until the end - Clemson 62, N.C. State 48. Tajh Boyd was a star this game, running in many of the game's touchdowns himself. The weather was perfect - but got very cold after the sun went down, but that didn't stop fans from tailgating into the night. One tailgate next to ours was singing karaoke while we were packing up our car. Special thanks to Summer Priddy for taking our gameday photos this week, and to the other Clemson Girls who submitted gameday photos of their own. 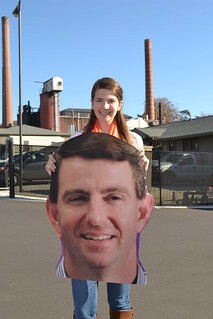 Are you interested in taking gameday photos for Clemson Girl at next week's game? Email us (clemsongirlblog@gmail.com) for details. You can view the Clemson vs. N.C. State gameday photos in the slideshow below, or view the entire album on our Flickr site.